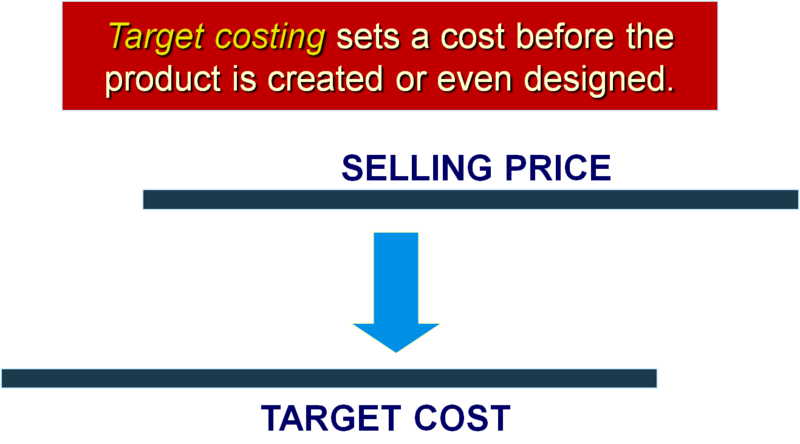 Before we look into the concept of target costing, we must first understand what a target price is. The target price is the estimated price for a product (or service) that potential customers will be willing to pay. This target price is estimated after performing market research amongst the potential customers, and taking into account prices of similar products offered by competitors. Determining the target price FIRST, even before actual production has commenced, is a sound concept. This forces the price of the product to be set at a price that customers will be willing to pay, maximizing the chances that the products will be 100% sold - hence, maximizing the revenue earned. (A business would not want a batch of products that are priced highly and yet remain unsold!) Thereafter, costs can be worked on and reduced, right from the very beginning, to maximize the profit. In short, we first set a target price, and then work out a reasonable profit. The difference between the target price and the profit will be the target cost. This pricing approach is usually used when market conditions are such that a business cannot influence prices – it does not have much sway over its customers and the market. Hence, the only way it can compete is to reduce its costs as much as possible in order to offer its products/services at a reasonable price, to encourage more demand. 1 Develop a product that satisfies the needs of potential customers. 2 Choose a target price. 3 Derive a target cost per unit. 4 Perform value engineering to achieve target costs. Value engineering is a systematic evaluation of all aspects of the value-chain business function, with the objective of reducing costs while satisfying customers’ needs. This can be done during the product design phase (before manufacturing) when costs of new machinery, materials, parts, future refinements are budgeted. At the same phase, cost structure can be determined by building up costs on an individual component level. Usually, a cross-functional team is involved – product designers, engineers, sales personnel, key suppliers, accountants – to consider how to reduce costs. For example, to cut costs, the product would be designed to be as simple as possible, with as few parts as possible, and still function as it is supposed to function. Prices of raw materials would be negotiated to be as low as possible, upfront, with the key suppliers. In the cost reduction exercise, value-added costs are not cut. Value-added costs are those that customers perceive as adding value, or utility, to a product or service. Take the example of a laptop. What adds value and can be seen to add value by the customer are: adequate memory, pre-loaded software, reliability and easy-to-use keyboards. What CAN be cut are non-value-added costs - costs that customers do not perceive as adding value, or utility, to a product or service. In other words, these are costs that customers do not care about. For example, transportation costs of getting the product/service to the customer, rework costs and repair costs. Customers do not care about how they obtain the product/service; they care about actually receiving it. Customers do not care about rework and repair costs as these are costs which correct product defects; a customer expects the product to be perfect when he/she receives it! Teddy’s management wants a 15% target operating profit on sales revenues of Century Computer, its product. Target price is $750 per unit. Target profit = $750 × 0.15 = $112.50. Target cost = $750 – $112.50 = $637.50. But current full cost per unit of Century Computer is $662.80. Hence, the collaboration of product designers, production engineers, marketing and finance staff is needed to manage costs at product design stage – BEFORE costs are committed – to reduce the cost down to $637.50 from $662.80. Return to Introduction to Management Accounting from this Target Costing.